These Keto Granola Bars are a great go-to snack or quick grab-and-go breakfast that you can make ahead of time and store on the counter. 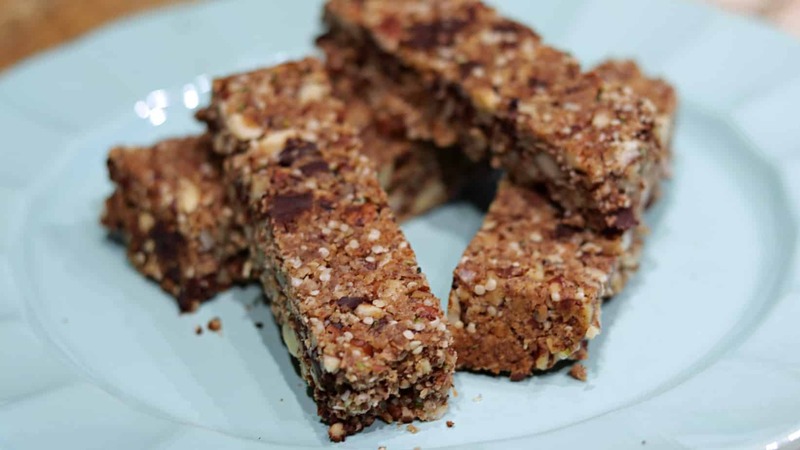 These densely packed and slightly sweet bars will fill you up, and give you energy to go about your day. They are perfect for people without a lot of time to eat in the morning, as well as a perfectly sized snack for when you may get hungry between meals and want a treat. Just the right sweet to hit the spot, without tasting like a candy bar. If you grow tired of eating eggs, meat, or cheese these are a good alternative. This recipe makes 18 bars if you cut them the same approximate size as a Quaker Chewy Granola Bar. Since these have no grains in them, they are a good all around Low-Carb and Gluten-Free snack, and of course they are Keto too. The hemp hearts are optional, but they do provide some Omega Fatty Acids to the bars that have many claimed health benefits. 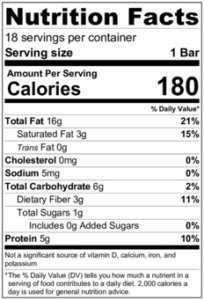 Likewise the Lily’s Chocolate Chips are also optional (or you can add more of those if you would prefer this to be more like a Keto candy bar instead. While they may look small to your eyes, your stomach will say otherwise. Being that these Keto Granola Bars are practically all nuts, these will not be water soluble like a traditional granola bar that just dissolves quickly in your stomach. Be sure to let me know what you think of them in the Comments Section below! Also, let me know if you have some favorite ingredients that you would add to your own to tweak them up a little bit too. On a Large Baking Sheet spread out the Almonds and the Pecans. Bake for 5 minutes at 375F. Sprinkle the Coconut Flakes on top of the toasted nuts and Bake at 375F for about 2-3 more minutes until light brown. Remove from oven and set on counter while preparing the other ingredients. Turn the Oven temperature down to 350F. In a small glass bowl combine the Almond Butter with the Coconut Butter and melt in the microwave for about 30 seconds. Stir these together until mixed evenly. In a Medium Glass Bowl whisk together the 2 Egg Whites with the 4 TBSP of Lakanto Monkfruit Sweetener. Pulse the Almonds, Pecans, and Coconut Flakes together in a Food Processor until they are finely chopped. Combine the Almond Butter mixture into the Egg Mixture and stir until evenly blended. Slowly add in the Toasted Nuts until evenly coated with the wet mix. Sprinkle in the Hemp Hearts and the Chocolate Chips and fold into the Nut Mixture until they are evenly distributed. Pour the Mixture into a 9″ x 9″ Baking Pan lined with Parchment Paper and spread out evenly. Bake at 350F for about 15 to 20 minutes until the top is firm. Allow to cool on the counter for about 30 Minutes before cutting. Store any leftovers in a sealable container on the counter for up to 4-5 Additional Days. This would be great with Coca Powder added too.. how much do you think one could use and not overpower the sweetner? 1/4C? 1/2C? Kelly, one thing to keep in mind is that Cocoa Powder is quite bitter on its own, so you may want to compensate with some additional sweetener. These don’t turn out sweet on their own right without the chocolate chips in them so I wouldn’t say that there is sweetness in there “as-is” to mitigate the cocoa powder. Definitely add some more sweetener when you add cocoa powder to this, in my opinion. These taste great but mine were crumbling. Hard to cut without them falling apart. Any suggestions? Mine were a little crumbly too when making the cuts. I used a very sharp knife to cut them. They also make a really good granola cereal in a bowl with Almond or Coconut Milk ;-). You could add more egg white next time to help bond them more if you want, and/or pulse the nuts more in the food processor into smaller chunks. Without having a sticky syrup like a lot of regular granola bars have, ours will be a little drier no matter what. Thank you for this recipe and the suggestion to add egg whites. I also liked the idea of crumbling it for a ‘cereal’. I’m still trying to find chocolate that isn’t 1) very expensive (Choco Zero/ Lily’s Chips) or 2) Made with all malitol, which doesn’t agree with me. I’ve settled on the less-than-keto 72% dark chocolate bars and chop it up. The cereal way of eating it really is tasty 🙂 Thanks! Lily’s is a bit pricey, being about $7 for the 9 oz bag, but I hardly ever use the whole bag in one recipe unless I am making a big batch of chocolate chip cookies or something. I try to ration that out. And yeah, Malitol and Sorbitol and all that is just hard on the digestive system. 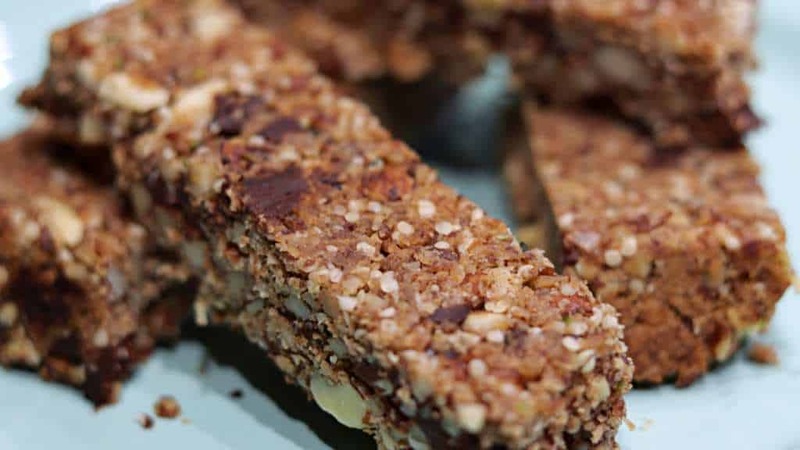 I made these yesterday and they are not bars at all…more like granola! Any suggestions now that they are cooked to get them to be bars? Add eggs, more coconut butter and almond butter & bake again??????? Disappointed!!! Do you think adding xantham gum or guar gum would add the “sticking” needed to hold it together? These taste fantastic! I substituted 1 cup walnut and just did a cup of the pecan and almonds. And I used chunky peanut butter b/c I was out of coconut butter. They turned out great! A little crumbly as mentioned above, but definitely a tasty Keto friendly snack. I’ll try adding more egg white to see if it helps next time. I also had the crumbling problem. I will try additional egg whites next time. Because I didn’t want them too sweet, I used unsweetened chocolate finely chopped, added about 1/4 teaspoon pink sea salt and eliminated the monk fruit sweetener altogether. You’re probably thinking they’ll be bitter, but they aren’t, the sea salt helps. They taste great and I like the texture.